Medical Technology is a digital magazine for the medical device industry. Published in an exciting, interactive format and available to read for free on the web and on iPads, this magazine brings together the latest news, market insights and technological developments from the industry. Looking at all areas of healthcare, from prevention and monitoring to diagnosis and treatment, we keep an eye on new research and innovation in materials, electronics, devices, manufacturing technologies, packaging and the supply chain – all you need as a professional in the medical industry to keep up to date with the latest developments in your field. Produced by an experienced team with a strong background in B2B publishing and delivered to a global audience of decision-makers through our expansive industry network, Medical Technology is essential reading material for healthcare industry professionals and an ideal platform for suppliers to showcase their products and services. Subscribe to Medical Technology and never miss an issue. In this issue: Detecting language problems in children, democratising patient data, aiding sepsis care, the future of MRI and more. In this issue: Transporting human organs for transplant, reprocessed single-use devices, regulating 3D printed devices, plus the latest comment and analysis from GlobalData’s healthcare experts. In this issue: A disposable rapid diagnostics device for infections, machine learning in healthcare, wireless charing and communications for implants, Costa Rica’s medical devices sector, plus analysis from GlobalData. In this issue: Complying with the EU Medical Device Regulation, machine learning in healthcare, Cyberdyne’s Hybrid Assistive Limb exoskeleton arrives in the US and optimising the healthcare pathway, plus the latest comment and analysis from GlobalData’s healthcare experts. In this issue: The UK’s National Centre for Healthcare Photonics, concerns over the future of healthcare exports to the EU, a software tool that creates mixed reality 3D models from MRI and CT scans, and all the latest comment and analysis from GlobalData’s healthcare experts. In this issue: A wireless charging breakthrough for implant treatments, molecular imaging for drug testing, gaining insights from data compliance, and all the latest comment and analysis from GlobalData’s healthcare experts. 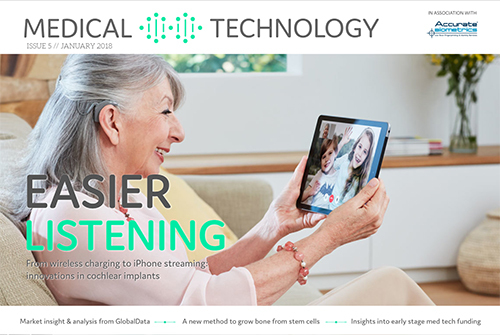 In this issue: Innovations in cochlear implants, a new method to grow bone from stem cells, insights into early stage med tech funding, and all the latest comment and analysis from GlobalData’s healthcare experts. In this issue: The world’s smallest surgical robot, designing medical devices for emerging markets, tackling drug adherence with connected technologies, and the latest comment and analysis from GlobalData’s healthcare team. In this issue: Securing the future of the UK medical device sector after Brexit, artificial intelligence for brain scan analysis, voice recognition technology for clinical trials, plus the latest market insight and comment from GlobalData. In this issue: Applications for wearable health trackers in clinical trials, eye implants for retinitis pigmentosa, a new business model for 3D printed prosthetics, and the latest comment and analysis from GlobalData’s healthcare analysts. In this issue: the potential of 3D printing, new developments in robotic surgical devices, the benefits of frugal innovation and the latest comment and analysis from GlobalData’s healthcare analysts.